Tecno WX4 is one of the new, exciting offers in Tecno’s W series of smartphones. You may think of it as an upgraded option to the Tecno WX3. 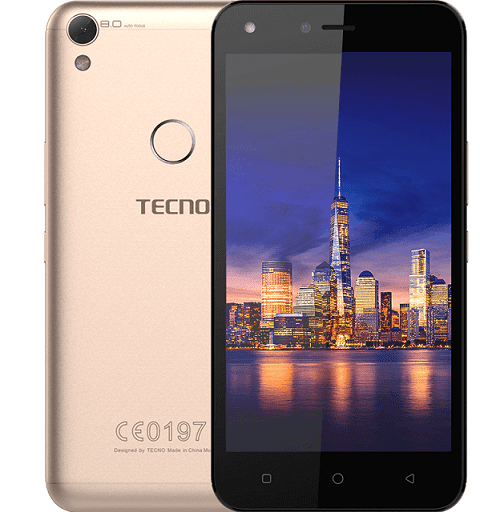 Tecno WX4 offers you a fingerprint scanner, Android Nougat, and a quad-core processor. You have a device measuring 8.5 millimetres in thickness here. We have seen slimmer phones. But you can’t complain since the Tecno WX4 will not set you back by a huge sum. It is available in gold, blue and grey colours. Tecno WX4 features a 5-inch display with an HD resolution of 720 1280 pixels. Images should come out sufficiently sharp on the device, except you are used to higher resolution displays. The Tecno WX4 offers similar resolution cameras as the new i3 smartphone from the same company. There is an 8 megapixel sensor on the rear and another 8 megapixel sensor on the front. Both offers flash support. This pair promises high quality images, at least on paper. Internal storage isn’t bad at 16 GB, plus you can expand this by another 32 GB using a microSD card. Tecno WX4 packs a quad-core processor, most likely one by MediaTek. This gets support from 1 GB of RAM. By today’s standards, the level of performance on offer here will likely be more satisfactory to entry level users. As for the software, the Tecno WX4 comes with HIOS, which is based on Android 7.0 (Nougat). A headline feature on the Tecno WX4 has to be the fingerprint scanner on the rear. That’s good for a change. Your sensitive information gets extra layer of protection. The 2800mAh battery on offer promises to support many hours of usage on a charge. Tecno WX4 comes with standard connectivity options you can expect on a smartphone these days. But there is no support for 4G network in sight on this one. Tecno WX4 is not yet available in Nigeria, Ghana, and Kenya. When available, you can buy the affordable smartphone at leading online stores in Nigeria and Kenya. Tecno WX4 Price in Nigeria ranges from 26,500 Naira to 35,000 Naira depending on your location in the country. Price in Kenya starts at around KSh 7,499.